Designing a perfect bedroom for your guests can be a daunting and time-consuming task. There are so many options to consider, such as ‘how much decorating should I do?’ and ‘how can I ensure my guests will be comfortable?’. We are here to help lighten the load with these 5 tips. When it comes to guest bedrooms, less is more. Therefore, it is advisable to keep the room as simple and depersonalised as possible. While it may be tempting to put your interior decorating skills to the test, your guest will feel most comfortable in neutral surroundings that allow your guests the freedom to make themselves at home without feeling that they are invading your personal space. There is a strong possibility that in the chaos that accompanies traveling, your guest may have forgotten to pack an essential item. Leave a collection of mini bath products in the bathroom – such as shampoo, conditioner, soap and toothpaste – as well as a towel on the bed. This saves the guest from having to ask and will make them feel welcome and their visit well-anticipated. Ambient lighting in a bedroom can be a key factor when it comes to decorating, as it can give the room a cosy and welcoming feel. Light colours, such as white or cream, will complement the natural daylight and give your guestroom a bright, open feel, whilst a combination of candles, ceiling and bedroom lights will give the room a cosy vibe. Ambient light has numerous sources; such as natural lighting from the sun, a bedside lamp, LED lights or from a chandelier. It is advisable to have a few different strengths of lighting, which will provide numerous options that can vary depending on your guest’s mood. Nothing is worse than arriving in an unfamiliar space after a long day of traveling, then finding the cupboards heaving with children’s hand-me-downs, winter jackets and old sports equipment. Ideally, a perfect guest room features both hanging space and a place for folded clothes, but it is vital that your guest has access to at least one of the two. No one likes to live out of a suitcase, so providing your guest with the option to unpack will help them feel more at home in a different environment. The most important factor you need to focus on when creating your ideal guest bedroom is simply your guest’s comfort. One of the main impositions to comfort is heat and living in South Africa, humidity can be a killer. Ensure your guest has a peaceful night’s sleep by investing in a good fan, in return for happy and comfortable guest. Solent offer a broad range of ceiling fans for you to shop for your perfect guest bedroom. There are so many different options to consider when planning your guest bedroom, so let us make one step easier for you. 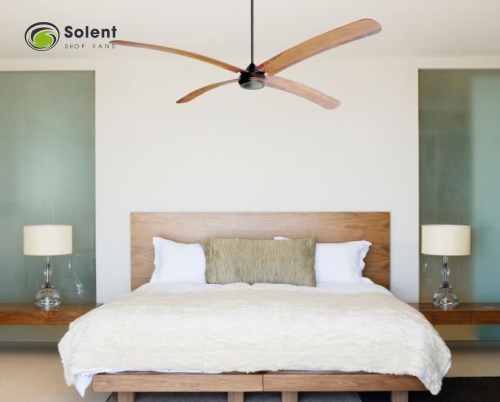 Now that you are more informed on the top tips to achieving your perfect guest bedroom, call Solent Ceiling Fans without delay and let us assist you in choosing a fan that will be perfect for your home.